Church gatherings are the perfect place to socialize and catch up with your friends and family. But it can be stressful trying to find the perfect dish that will please everybody. 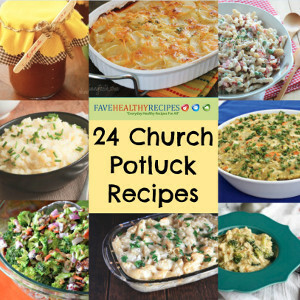 If you're stumped on what to make, our collection of 24 Healthy Dinner Recipes for Church Potlucks should help you out. These easy healthy recipes are comforting, savory, and absolutely delicious. Many of them include healthy ingredient swaps, which will make them more nutritious without getting rid of their familiar flavor. That way, these dishes will satisfy your appetite without ruining your diet. They don't take very long to make, which makes them excellent options to whip up if you're pressed for time or just don't like spending much effort in the kitchen. For your benefit, we've divided these healthy dinner recipes into three categories: salads, sides, and main dishes. We know that you'll enjoy them because they are all guaranteed to please a crowd. If you're searching for additional easy healthy recipes to add to your dinner table, we highly recommend you read our collection of 20 Low-Calorie Dinner Recipes. Whether you serve them on the side or enjoy it before your main course, deli salads add a refreshing element to dinnertime. The best news is that these deli salads don't require much preparation time. We think you'll agree that the recipes below are very tasty! Side dishes are the best ways to complement a meal. These healthy dishes are practically guaranteed to please a crowd. You can whip them up easily! These healthy dinner recipes will fill you up on the right ingredients without adding any extra inches to your waistline. We know that you'll love these lightened-up versions of some of your favorite classic recipes. 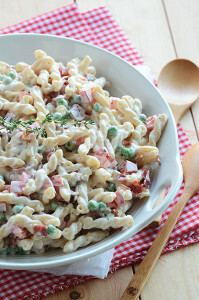 Looking for more healthy dinner recipes to bring to your next potluck? 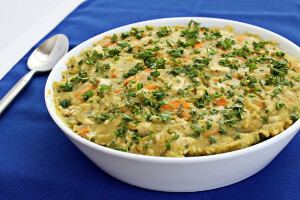 Check out our free eCookbook, Potluck Ideas: 8 Vegetarian Recipes. You know that even if these are blessed by the church they look absolutely disgusting. The presentation is horrible and makes a lump come in my throat. 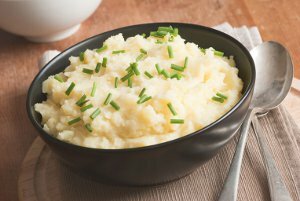 Maybe they are over cooking it or making it for someone that needs it pureed, but for Heaven's sake would you really serve this mess???? OH WOW, Sharlo....why don't you tell us know what you REALLY think? !